When I was writing about the 1974 Roy Harper and friends free concert in Hyde Park the other day it made me think about the Windsor Free Festival of that year. I visited the Windsor Festival that year to see what it was like, wandering around Windsor Great Park for a few hours taking in the atmosphere. I drove across from the Reading festival with a friend, tempted by the leaflets that were being given out on the Reading site. 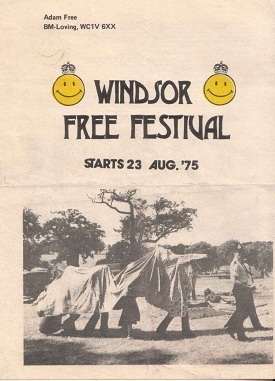 The Windsor Free Festival was held in Windsor Great Park from 1972 to 1974. It was organised by a group of hippies from London, and was the forerunner of the Free Festival movement and later events like the Stonehenge Festival. The festival was set to run for 10 ten in 1974, starting over the bank holiday weekend, and continuing to the following weekend. Some friends were intending to go to Reading, across to Windsor, and then finish the festival week with the free Hyde Park event. Being a weekend hippy, I just popped across to Windsor for a visit, and went home between the weekends. I don’t recall which bands I saw but do remember the great friendly atmosphere at the festival. I can’t recall which day I visited, probably on the Monday, on the way home from Reading. I didn’t see any of the main bands who were, I think Hawkwind and Gong. 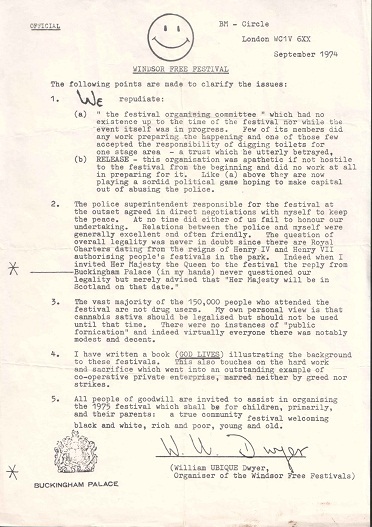 The 1974 Windsor Free Festival was the largest, and also the most eventful, festival as a result of the police reaction to the gathering. On the Wednesday morning the police raided the festival and broke it up, amid reports of police brutality. Although I wasn’t there that day, some of my friends were, and they told me about it when I met up with them at Hyde Park on the Saturday following that eventful Wednesday. I have some flyers about the event which were given out at Hyde Park, and have copied them here. See: “Why did the cops smash the festival?”, which tells the tale of the day. 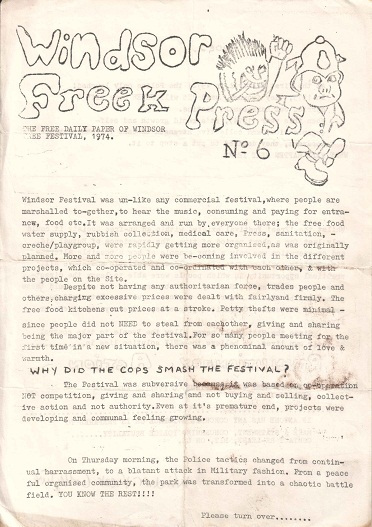 I also have a flyer for the 1975 Windsor Free Festival, which was planned for the bank holiday week, but didn’t take place for legal reasons. I must have picked this flyer up at a festival somewhere during 1975. An alternative event took place at Watchfield, which I also attended, again after the Reading festival. It wasn’t a particularly well attended event, and had lost some of the spirit of the previous year’s festival at Windsor. Those days of the free festival and its ideals seem so long ago, and so different to the events we have now, which have become much more middle of the road, and corporate. We lost something along the way. In those days a group of hippies believed that they were building an alternative society, and I guess some of them did, and are still living it through the new age travellers movement which is the descendant of those events in the 70s.